Until the 1830s, Ilfracombe in north Devon had a small community that relied heavily on the fishing industry for jobs and local economics. The development of the railways made it a popular tourist resort and inspired a construction boom in the area. Indeed, much of the town ;as it stands today was built during the Victorian period. 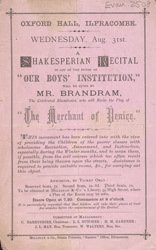 The Oxford Music Hall staged many concerts and plays - in this case a one-man recital of Shakespeare's 'The Merchant of Venice'.